This cozy prow-front 'A' Frame cabin features the perfect location for year round fun! 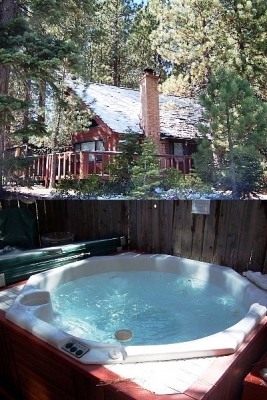 Just on the outskirts of town but still only 10 minutes from fantastic Lake Tahoe beaches, downtown casino nightlife, and world class skiing at Heavenly Ski Resort, this wonderful cabin has a private hot tub, large living space with a rock fireplace, a 37' flat screen TV, brand new leather sofas in 2007, and a secluded feel hiding in the woods. Also, just across the street you will find wonderful hiking and biking trails through our National Forest or take a short 5 minute drive to 2 premiere golf courses in the summer and snowmobiling in winter. Come and enjoy this wonderful cabin any time year! Please note: The home does allow pets with a $200 deposit.